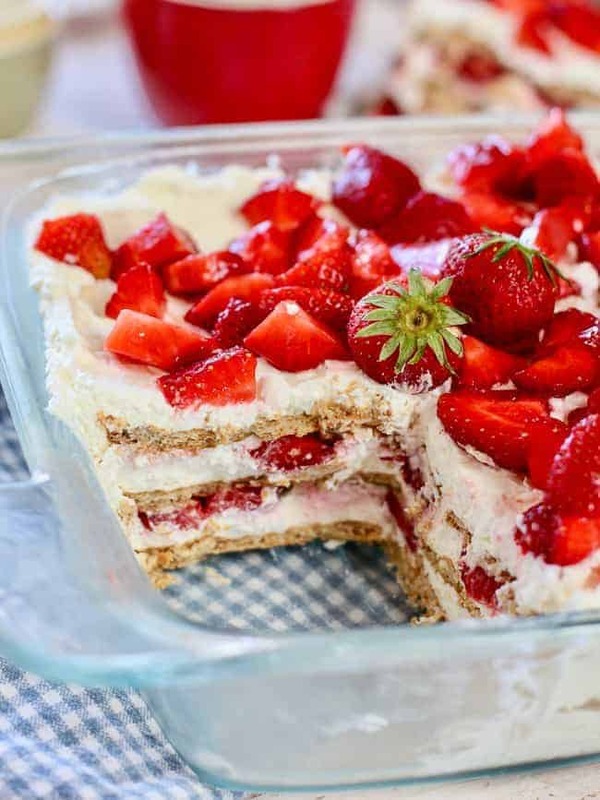 No Bake Strawberry Shortcake Icebox Cake! Fresh and cool and incredibly easy to make. 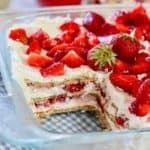 Layers of whip cream and cream cheese with fresh strawberries and graham crackers. Helloooo Summertime! We love healthy recipes around here, but every once in awhile a dessert comes along that must be posted! Last weeks Skinny Taco Dip gave us enough wiggle room in our skinny jeans to justify this decadent dessert! I mean there’s fruit….right? I have heard of icebox cakes for years but really, had no idea what one was. Turns out it’s the easiest and most delicious dessert to make everrrr! Not too sweet with a rich and creamy filling. You can sub most any fruit. Blueberry, raspberry and peach are a few that sound fabulous. 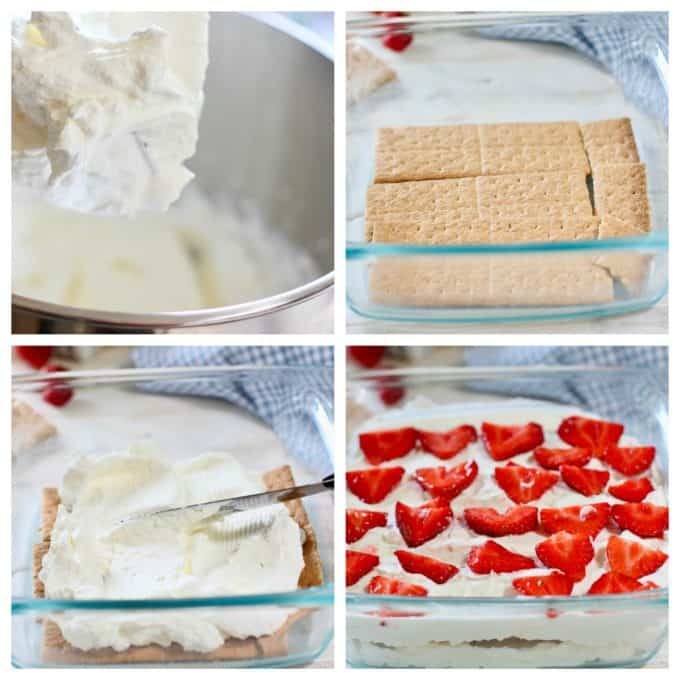 Layer graham crackers, a mixture of whip cream and cream cheese, fresh strawberries, now repeat two more times, ending with fresh fruit! Cover, store in the fridge for at least two hours and I am telling you what ..wow to flavor! 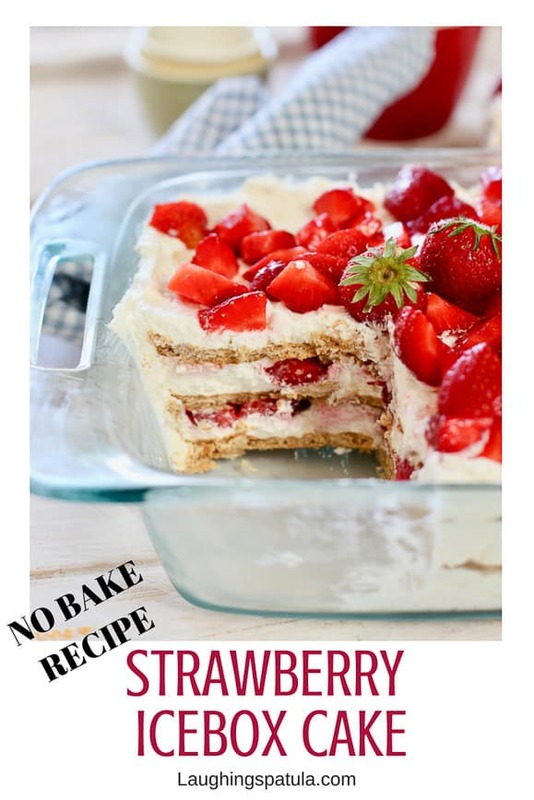 FIVE ingredients is all you need to make this fresh and fabulous Strawberry Icebox Cake! You can easily double this recipe for a 9 x 13 pan. Simply hover over the servings amount in the recipe card and it will do the work for you … I love it when cake and technology collide! This can be made several days in advance. 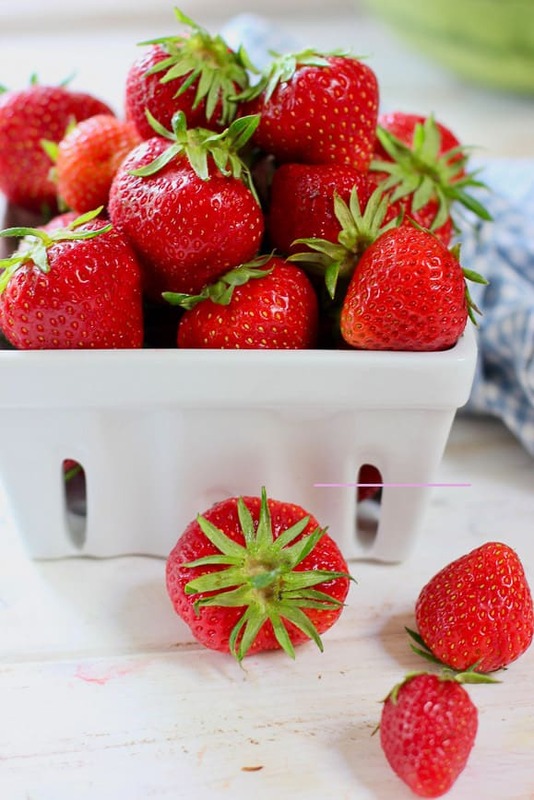 Leave off the last layer of fruit until the day you serve to keep the fruit fresh on top. Check out all of our easy to make desserts HERE! Our most popular treat this summer is our FRESH KEY LIME CAKE that can be made with regular limes as well as Key limes. To occasional indulgences and those that enjoy them! What do you think about this recipe?Have questions? Comment below!Don’t forget to like us on Facebook, andÂ connect with us on Instagram and tag your @Laughingspatula recipes with #laughingspatula,while you’re at it…We love to see your pics! Fresh layers of whipped cream that have been combined with cream cheese. 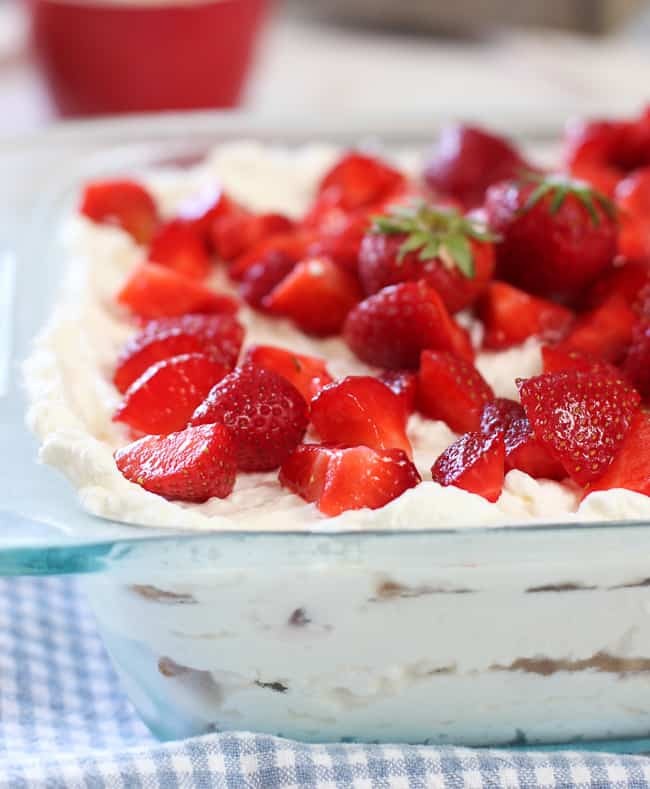 Graham crackers and fresh fruit make up the rest of this easy no bake cake recipe. Pour cream into large mixing bowl. Using an electric mixer, mix on high until cream is whipped and stiff peaks form. About 3-4 minutes. Add the cream cheese, sugar and vanilla. Blend until all cream cheese is incorporated and no lumps remain. Another 2-3 minutes. Line an 8 x 8 baking pan with one layer of graham crackers. Spread a third of the cream mixture on top of the crackers. Top with sliced berries and repeat two more times. Top with remaining berries and chill for at least two hours to soften the graham crackers. Best if overnight. NOTE: if making several days in advance do not add the berries on top until a couple hours before serving to keep them fresh. Slice with a sharp knife and serve! Never miss a Laughing Spatula recipe! So perfect for Canada Day or the 4th of July! Enjoy the upcoming holiday! Thank you Elaine! I hope you get a chance to try it! Hi! We are Kathi and Rachel, a mother daughter blogging team creating easy to prepare foods made with fresh ingredients that your whole family will love!